Bath Step For Safety For Those With Visual Impairments. The Red Step Two helps those with a visual impairment to locate the step - a white step against a white bath can be difficult to see. This makes bathing easier and safer by reducing the danger of falling when climbing into the bath or shower. The step has two heights (101mm or 152mm / 4in or 6in), depending on which way it is used. Choose the height which is closest to the base of the bath, to prevent over-reaching. 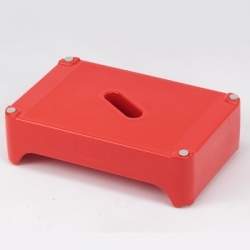 The Red Step Two provides a large standing area for both feet, so the user can be steady before stepping over the side of the bath. The textured surface helps to reduce the risk of slipping. A carrying handle in the middle makes it easy to move. This is ideal for my husband to use as he is visually impaired and has problems seeing the white bath steps. Quick delivery too which is a bonus.